The first thing that came to my mind is the fact that you have to install Powershell Core manually. Not just that, you have to click through a setup menu. So I could have been lazy (probably should have) and just answered that to the tweet. But I knew something that was more fun. Let’s automate this! So I wrote a script that can be run in Windows Powershell and will Download and install Powershell core. To make sure it has the latest version, it does a search on the github page where Microsoft publishes. And you (hopefully) are done. If you want to use Core in Visual Studio Code, you need to do something extra, as it defaults to 5.1. Open Studio code and just click the 5.1. 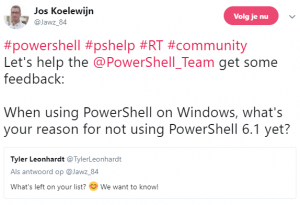 A menu will open, asking you if you want to use another kind of Powershell. You can switch back as needed.